OH Hello everyone! Hope you had a wonderful weekend. I watched heaps of videos on how to colour using Prisma colour pencils and Polychromos pencils on my vacation I had over the last week of April. I focused on techniques of blending and also real time videos of colouring with colour pencils. What I learned watching the videos? I love layering with colour pencils to blend rather than blending them with either white pencil or burnishing pencil or using Gamsol. With all these techniques of blending, the vibrancy of the colour is lost. I love vibrant colours. By layering colouring pencils over and over, it is easier to blend and the colours are vibrant. 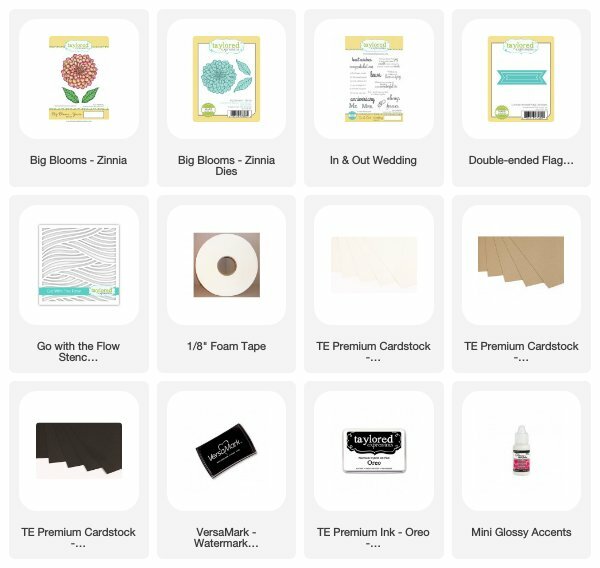 The catch to doing the layering to blend is PATIENCE.Lol! That is something I totally lack. Partly because of having so much to do at home and everything called LIFE, I never get couple of hours to myself. I don’t craft at night because of the lighting. I prefer natural light to artificial light. So it takes a long long time to complete colouring with pencils. 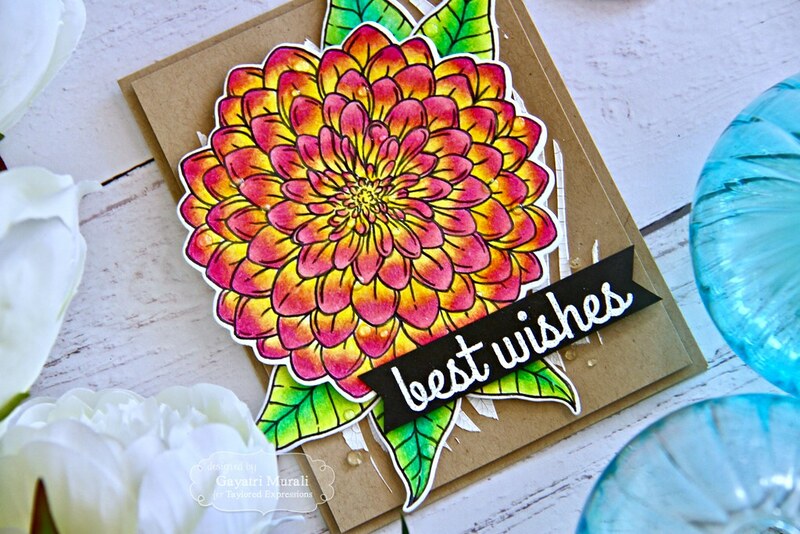 Anyway, this flower and leaves from Taylored Expressions took me five hours in all to colour with a lot of interference and another half an hour to put the card together. 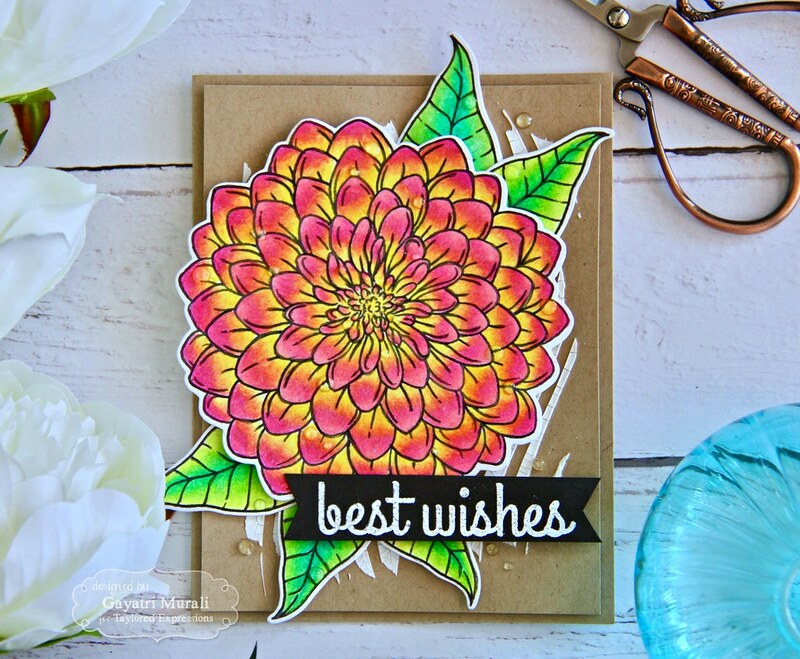 I have used the new Big Bloom: Zinnia stamp from Taylored Expressions here. The size of the flower is large and beautiful. Fills an entire card front. Great big focal point. 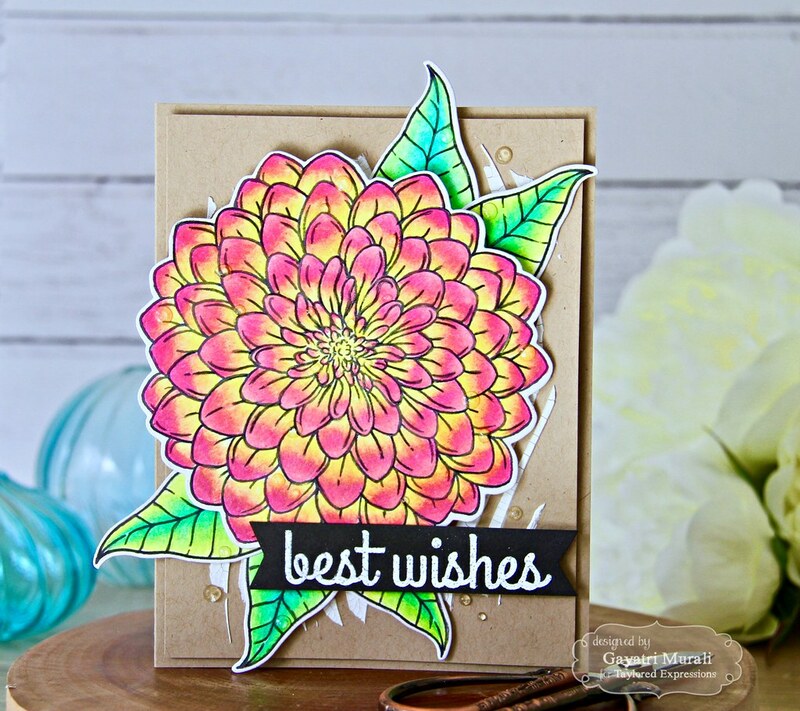 I stamped the flower and leaves using TE Oreo hybrid ink on Sugar Cube cardstock and coloured the images using Prisma colour pencils. I used two colours that do not blend easily with each other. To achieve the blend, I used a lighter and darker shade of Pink and Yellow pencils. The lighter pink over lighter yellow makes the transition smoother. No straight lines between the two colours. Each petal has four to five layers of the colours to get a decent blend. By the time, I finished the flower, I lost my patience. Thankfully the leaves were large and colouring them was easy. I die cut them using the coordinating dies and cluster the flower and leaves using glue. To make the coloured images pop, I used Toffee cardstock for the background and cardbase. On the background panel, I used texture paste on Go With the Flow stencil to add interest and texture. I adhered the flower cluster on top of the textured background panel using foam adhesives. The panel is adhered on the card base using foam adhesives as well. The sentiment is from In & Out Wedding stamp set which is an older set. I white heat embossed the sentiment on a piece of Oreo cardstock and die cut using Double Ended Flag Stacklet. 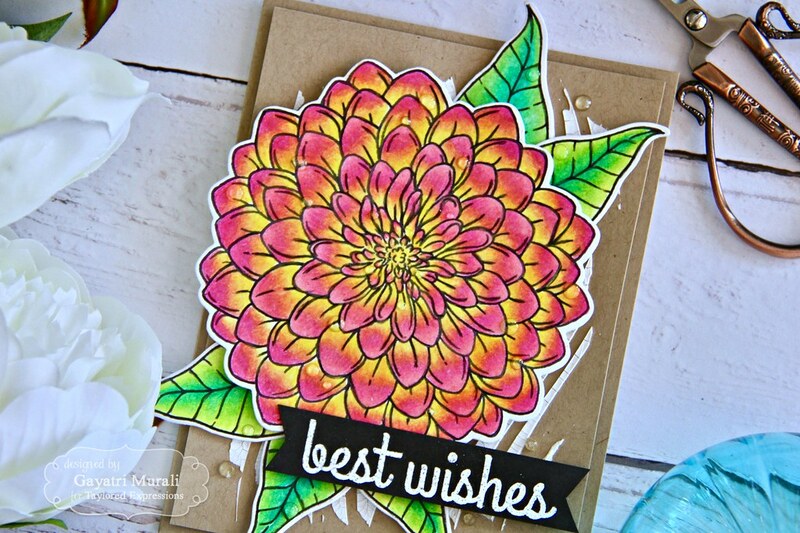 I added some glossy accent as dew drops on the card front and brush shimmer on the flower. Here are some closeups. Thanks so much for visiting my blog today. Have a wonderful week!